On 3 October, CENTR held the third edition of its Awards at the Bibliothèque Solvay in Brussels. The CENTR Awards aim at highlighting ccTLD registry projects, teams and people that are making a difference in our industry. During the ceremony, the finalists in each of the five categories presented short videos of their projects or people that were nominated. The evening was a great opportunity to showcase inspiring projects and teams that truly make a difference in the online world and to demonstrate the great spirit of collaboration that gives life to the CENTR community. A brand new category was also introduced this year: the “Registry of the Year”, first one to be submitted to a vote from registrars. A whopping 105 unique registrars participated in the survey that resulted in a tight race between registries. Safe and Sound DNS Category: Barbara Povše (Registry.si) & Bert Ten Brinke (SIDN) for the project "Security for Registry.si"
Barbara Povše (Registry.si) & Bert Ten Brinke (SIDN) for the project "Security for Registry.si"
The CENTR membership is invited to cast its vote for the Contributor of the Year! The survey is open until 14 September. This CENTR Award category is submitted to a vote from the membership and to members of the CENTR Award Jury. Through this survey, the CENTR membership is asked to vote for one nominee (one vote per registry). Full and associate members are invited to cast their vote. The CENTR Award Jury will also be ranking the nominees and the results will be added to the membership’s votes. Registrars are invited to vote for the Registry of the Year! The survey is open until 14 September. There can only be a single submission per registrar (organisation), but registrars can rank as few or as many ccTLDs as they are selling (direct relationship only). If more than one submission is received from a single registrar, CENTR will only take the first submission into account. For a registry to be counted in this category, it needs to receive ratings from at least 10 different registrars. Scores will be submitted to an average rating system. Greater Online Good Award: project, team, person or initiative developed by a registry in the area of corporate social responsibility (CSR) such as environment compliance, digital inclusion, awareness and education, or promotion of the local (national) internet resources and community. Contributor of the Year Award: person or registry who contributed most to the ccTLD community through knowledge sharing, creation or support through active participation in a CENTR Working Group, for instance. ***NEW*** Registrars’ Pick: Registry of the Year Award: registry that has developed or exceptionally improved on high quality service towards its registrars. Any CENTR full and associate member can nominate a project, team or person, including one of their own, to any of the first five categories (Registry of the Year being the exception, as registrars will be voting). Members can also nominate projects and/or persons that were already nominated in 2015, except if that project or person won an award in 2015. The CENTR Awards Task force will shortlist the applications to submit to the jury (three per category), with the help of the working group chairs. 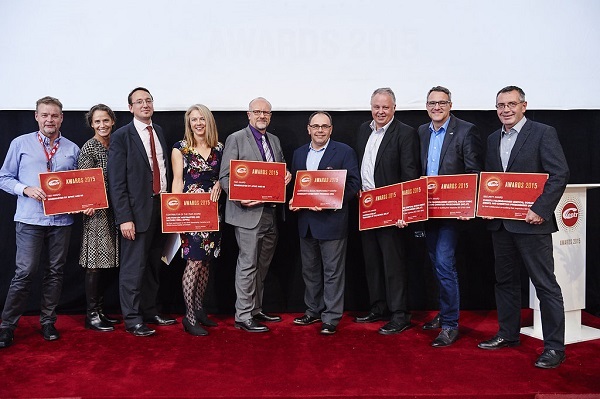 In 2015, CENTR held the second edition of its CENTR Awards, which aim at highlighting ccTLD registry projects, teams and people that are making a difference in our industry. The goals of the CENTR Awards, which are open to all full and associate CENTR members, are to focus on the positive aspects of our industry, to show recognition for innovation, to encourage sharing of best practices, and to provide an opportunity to challenge and motivate employees and project leaders. Any CENTR full and associate member can nominate a project or person, including one of their own, to any of the 5 categories. Members can also nominate projects and/or persons that were already nominated in 2013, except if that project or person won an award in 2013. The CENTR Awards ceremony took place on 7 October 2015 at the Palais des Académies in Brussels, Belgium. 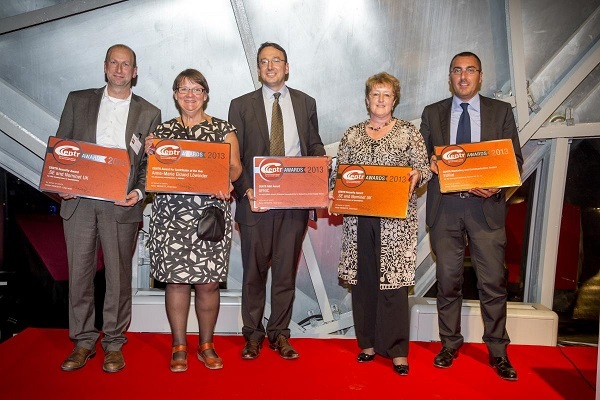 The Winners of the first edition of the CENTR Awards were announced on a special ceremony at the Atomium in Brussels during the Gala dinner for the 50th CENTR General Assembly. CENTR members could nominate projects under the 4 categories - Security, R&D, Marketing and Communications, and Contributor of the Year. A Jury selected a winner amongst the shortlisted projects. CENTR wants to thank the Members of the Jury of the CENTR Awards 2013: Carolina Aguerre (LACTLD), Kim Davies (IANA), Bertrand De la Chapelle (Internet & Jurisdiction Project), Sam Dickinson (Lingua Synaptica), Achilleas Kemos (European Commission, DG Connect), Marcus Kummer (ISOC).